Taking over shop operations and offering customized solutions make Transervice one-of-a-kind. Transervice Logistics Inc., headquartered in Lake Success, NY, has found a formula that has led to long-term relationships with many of its customers. It begins with decentralization: having people in the field working close to the customer. And while many businesses have field sales and service personnel, the great majority of Transervice employees — 1,150 of the 1,200 people employed by the company — work at the customers’ locations, according to Wolfgang Marschhauser, senior vice president of sales and marketing. Having its people on-site “is very important to operate our business successfully,” he says. Transervice goes a step further by empowering the people who are on-site to make decisions so they can satisfy the customer’s needs. Transervice employees including the management with oversite responsibility act like a department in its customers’ business. “Our managers are in the office next to their managers and our employees participate in strategic planning meetings with our customers,” according to Marschhauser. 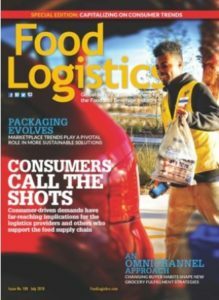 Following its successes in the beverage industry, Transervice branched out into the food market with transportation and fleet operations for Waldbaums and A&P. In 1989 it added Wakefern Food Corp, which is owned by and services ShopRite — the largest retailers’ cooperative group of supermarkets in the U. S. — as a customer. “We operate four locations for them and have close to 200 tractors operating under full-service lease with them,” Marschhauser says. Transervice offers a full range of options to its customers. In addition to contract maintenance and leasing, it handles warranty administration, safety training, equipment disposal and fuel tax reporting. Dedicated contract carriage is another of the company’s capabilities and that is the same business model it uses with Kroger. In 1998, the company began servicing its first Kroger location in Indianapolis where it provided maintenance not only for the company’s tractors and trailers but also, for its MHE. Shortly thereafter, it began providing logistical services by employing drivers who distribute Kroger’s goods from the DC to the Kroger stores throughout the region seven days a week. In 2004, Transervice was awarded Kroger’s King Soopers’ Denver, CO location, which employs 120 drivers and 18 technicians. “The unique thing about this operation is that many of the company’s trailers are parked off site at the old Stapleton Airport, so we service them via specially designed mobile maintenance units,” Marschhauser explains. In 2007, Transervice added Kroger’s Louisville, KY facility to its customer roster. The company also provides vehicle maintenance, repair and drivers at this location and has created a full logistics partnership. Through the years, Transervice has continued to build its portfolio of customers in the food service industry, adding vehicle maintenance operations at the Melrose Park, IL operation of Jewel-Osco (a division of Albertsons) in 2011. It also handles maintenance for Western Beef, a grocery and meat distributor with 26 stores in the New York metropolitan area and provides full-service leasing and maintenance for two California locations of Performance Food Group (PFG). Since PFG had no existing shops at these locations, Transervice set up steel canopies under which its technicians work on the vehicles protected from the elements. Technology plays a huge role to ensure a quality outcome, specifically being able to monitor things like reefer temperature to ensure the foods being transported are kept at the proper temperature throughout their journey. 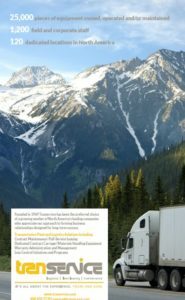 The trucking industry has responded to many changes related to emissions regulations, including the need for diesel particulate filter and diesel exhaust filters. These add complexity to the vehicle and have resulted in the need for technology investments in the shop in order to service these newer, more complex vehicles effectively. Transervice helps its customers navigate the spec’ing process to ensure their vehicles comply with regulations, are as fuel efficient as possible and operate in an optimal manner while remaining cost-effective. Once the proper equipment is procured, Transervice goes to work making sure it is maintained properly and this has meant significant investments in diagnostic tools along with technician training. The final step in ensuring a cost-effective operation for its customers involves providing appropriate training for its drivers to enhance their driving capability and investing in technology such as collision mitigation, lane departure, anti-rollover software that helps them do their jobs more safely. Transervice can also help its customers with support services such as route optimization and asset utilization as well as data analytics. “Data is coming from everywhere,” Marschhauser says. “Whether it is the engine, the OBC’s, computerized maintenance records, etc., there is a lot of data available. There are challenges in coordinating all of this data in a meaningful and usable way. Our systems and processes allow us to effectively obtain this information and convert it into executable and beneficial actions”. For the past 49 years, whether it is helping to optimize fleets, maintaining rolling stock and MHE, leasing equipment or providing drivers, Transervice has been dedicated to creating specialized programs to ensure the success of its customers in the food and beverage industries, as well as those in a host of other industries. 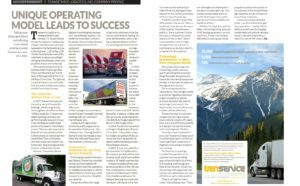 Transervice’s unique operating model – on-site, full disclosure, gain share operations – coupled with its ability to quickly react to changing market needs and customer demands leaves it well positioned to be successful for another half-century.